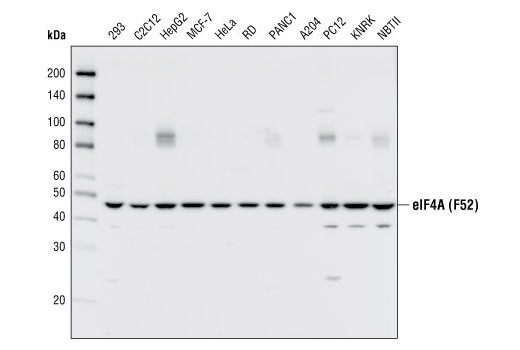 Western blot analysis of extracts from various cell types using eIF4A (F52) Antibody. eIF4A (F52) Antibody detects endogenous levels of total eIF4A1, eIF4A2 and eIF4A3 proteins. Polyclonal antibodies are produced by immunizing animals with a synthetic peptide corresponding to residues surrounding Phe52 of human eIF4A. Antibodies are purified by protein A and peptide affinity chromatography. A variety of factors contribute to the important biological event of initiation of translation. The eIF4F complex of translation initiation factors binds to the 5' m7 GTP cap to open up the mRNA secondary structure and allow small ribosome subunit binding (1). eIF4A, an eIF4 complex component that acts as an ATP-dependent RNA helicase, unwinds the secondary structure of the 5' mRNA untranslated region to mediate ribosome binding (2,3). In addition, eIF4A has recently been shown to repress Dpp/BMP signalling in a translation-independent manner in Drosophila (4,5). Rogers, G.W. et al. (2001) J Biol Chem 276, 12598-608. Rogers, G.W. et al. (1999) J Biol Chem 274, 12236-44. Svitkin, Y.V. et al. (2001) RNA 7, 382-94. Li, J. and Li, W.X. (2006) Nat. Cell Biol. 8, 1407-1414. Affolter, M. and Pyrowolakis, G. (2006) Nat. Cell Biol. 8, 1319-1321.